Our friendly Gmail service thoughtfully sorted this email into our spam folder, so we don't know if the problem has been resolved or not. Even if it was taken care of, though, imagine this funky crap marinating in August heat and humidity. We've seen and smelled disgusting garbage trucks in our lives, but what the hell was in that thing? Our apologies if you've viewed this photo right before or after a meal. 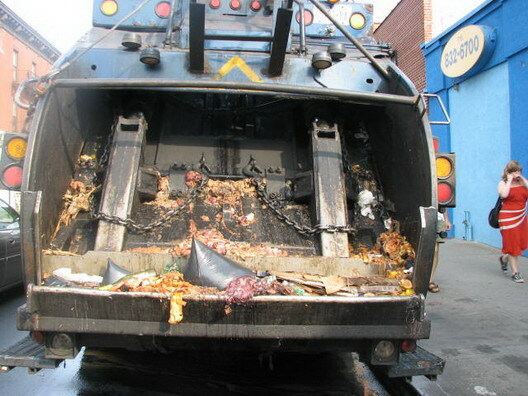 Problems with garbage trucks in Gowanus? Get outta town! Last week I was riding my bicycle on the bikepath headed south on 3rd avenue when I heard a loud honking behind me. It was a private sanitation truck trying to pass traffic on the right by driving on the bikepath. When I finally just stopped in the middle of the bike path, they pulled back into traffic, slopping gallons of foul smelling liquid out the back every time the trcuk hit a bump.